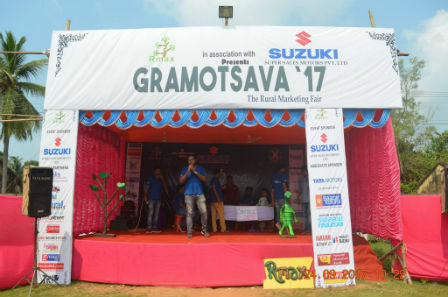 Bhubaneswar : Gramotsava, the flagship event of Xavier School of Rural Management, Xavier University Bhubaneswar, in association with Super Sales Suzuki Motors, was successfully conducted at Nimapada, in the Puri district and topped off on 24th September 2017. It is essentially a rural marketing fair and its main objectives include, the promotion of Products & Services in rural areas, conducting of need based market research and fostering of productive relationship between the rural community and the organizations functioning in the rural sector.The theme for this year’s Gramotsava was ‘Smart Village’. Gramotsava consisted of three phases- Aadi Parva (Pre-fair phase), Madhya Parva(Fair Day) and Iti Parva (Post-fair phase). The event kick started with the launch of Gramotsava’s official video, and it officially commenced with the ceremonial lighting of the lamp by Prof. Kajri Mishra, Dean of Xavier School of Rural Management. This was followed by unveiling the banner and this year’s mascot, the olive ridley turtle ‘Boney Bhaina’, a string of cultural performances and the release of the fifth volume of Dhwani, the annual magazine of RMAX. The event was concluded with the vote of thanks by Deepak Mishra, Co-Ordinator of RMAX – The Rural Managers’ Association of Xavier School of Rural Management. The rural marketing fair was held for two days – 23rd and 24th September 2017, intended to bring leading corporate brands closer to the rural hinterlands. Some of the esteemed corporate and social entities associated with the fair were our Title Sponsor- Suzuki Super Sales Motors Pvt. Ltd., our Co-sponsors- Bazaar Kolkata, Punjab National Bank, Tata Motors Consortium. Many stalls were installed where around 200 budding rural managers extensively promoted the products and services of the organizations functional in the rural area achieving the milestone of good sales for Bazaar Kolkata and around 200 data leads. Whereas a stall handled by the RM Alcom-The Alumni Committee promoted Digital Education in memory of an alumni Late Dighir Ganguly. Here are some of the experiences shared by students –“Gramotsava was the best platform to learn about rural marketing strategies. Interacting with rural folks and knowing their preferences was indeed an enriching experience” says Pramitee Behera. “The experience of working with Swaraj Motors was an enriching one both in terms of knowledge and fun. The Van Promotions helped me to gain an insight as to how to make yourself heard, pitch your product and convince them to be on Gramostava ground. The rigorous efforts of all the team constituted the success of the event as well our own live project” as shared by Siddhant Kumar. Innovative games and live demonstrations were held to study the perception of the rural customers. Free dental checkup, cultural activities like skit themed on Ramayana and dancing competition attracted a largenumber of audience. Fr. Arockia, Fr. Donald and Fr. Alwyn graced the event with their presence.